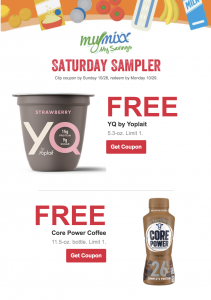 Two MyMixx freebies this week at Jewel, a YQ 5.3 oz yogurt by Yoplait and a 11.5 oz Core Power Coffee. There is a 30¢ rebate showing on SavingStar. Add these paperless coupons to your Jewel MyMixx account by Sunday, 10/28 and redeem by Monday, 10/29.